Okay quick overview, I am setting up a 55g reef for my school, it is "mine" and im putting it together/ caring for it. But the whole thing is under the schools budget. So I have over a grand to put together the coolest reef ever :woot: . Okay this already happened but ill start from scratch. I went to my LFS store and I bought a 55g w/stand. I set the tank up overnight and its just sitting there. I don?t have pics from today. I brought in my personal 10g freshwater and 10g nano reef for the schools use. The freshwater tank is a planted tank with all low light plants and no special lighting. it has an assortment of tetras and white clouds, nothing big. 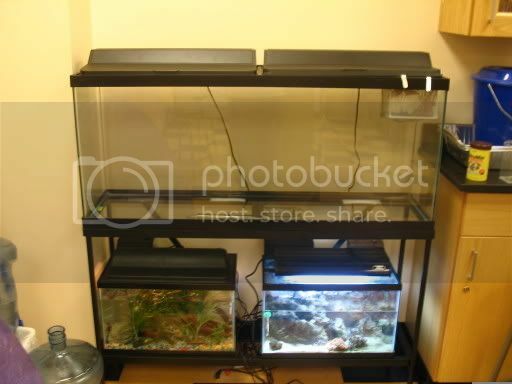 the tank has a tetra whisper filter for a 20, a heater some rocks, nothing really amazing. The nano has no Fish in it, but has about 20lbs of live rock and live sand and is home to a blue maxima clam, some brown polyps and some mushrooms, its not finished because im always working on it. 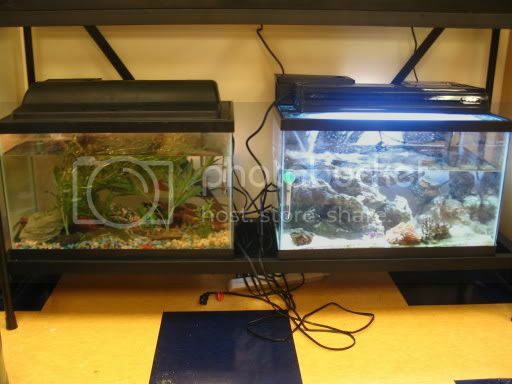 it has 2 filters a tetra 30 and a tetra 10, a heater, and a PC lighting system with about 55 watts of lighting. is it for science classes? Yup, the science budget covers ALL of it. it was actualy around 80$ but the school covered all of it, it comes in the mail fri, cant wait. Very nice....and it is looking very good!!!! As Always, Ron<br><br>"If two people agree on everything, you may be sure that one of them is doing all the thinking." -- Anonymous<br><br>Current Tanks: 300g Leemar Diamond Edge Glass Tank- 96Lx24Wx30H. Two Little Giant - MD4 Return Pumps, Arctica 1/3 hp Chiller, 75 gal Refugium, 25 gal ro/di top off tank for the osmolator, Two Tunze 6100's+7095 Multi-Controller, Osmolator - with Kalk Dispenser, ASM - G3 Skimmer, Phosban Reactor, 5X 250W Geisemann Novas II DE MH - Hamilton 14K bulbs. Location: Valley of the Sun!! i know and my lights come tomroow so ill update.